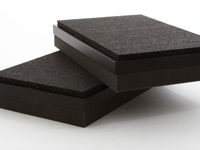 Acoustic Foams and or sometime as they get called soundproofing foams are not a new concept. They have been around for years which the same can be said for us. 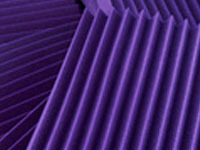 For the last 10 years we have researched and developed Acoustic Foams to take the market forward and improve acoustics and that of the industry standards. Long gone are the days of thinking Acoustic foams were simply Egg Shell or Egg Box Designs only. 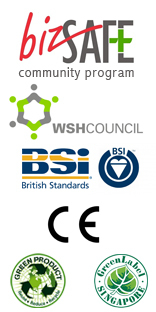 In the past we saw a lot of customers using egg box or egg shell foams, rockwool covered in fabric, bed matress foam, packaging foam, computer packaging foam to name just a few. 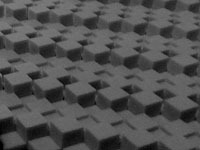 In 2005 we started to make changes in the market by introducing our high end professional acoustic foam products and materials. A lot of the things you see and take for granted everyday is a result of us pushing this change in the market. Acoustic Foams don't need to look boring and ugly, Acoustic Foams can look fresh, stylish and funky. 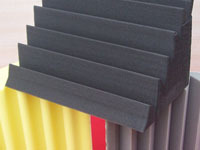 We were the first that created the change for the industry that swept over the years globally and now as you can see the market now has many different types of acoustic foams available for all to you. 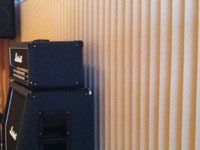 One of the things that people often get wrong when using acoustic foams is the overuse of them. This we call a dead room or flat sound. This results when you use to much absorption acoustic foam, where as some foams have higher densities and can be reflective so that the room is better balanced. This flat sound isn't really what experts or professional musicians consider to be a good sound or environment to experience sound. 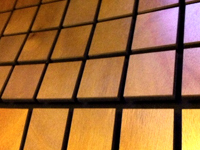 Absorption, Diffusion and Reflection are all needed when treating Acoustics in a space. 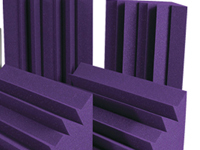 Our foam range goes beyond the old ideas and moves towards a much better sound and end result. 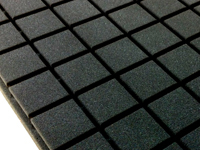 This is achieved using different types of materials to create the foams and in different densities and finish to create acoustic foams with specific purposes in mind. 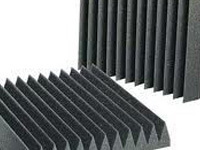 We manufacture and supply Acoustic Foams to many companies and leading brands worldwide which you've probably seen our foam without even knowing it. 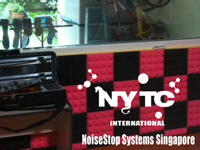 We have distributors in most counties selling our Acoustic foams such as Acoustic Foams Ware House in Singapore and many more. There are recommended retail prices for our products, but for companies selling as OEM then we are not able to control these prices. 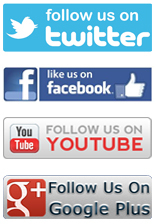 If in doubt come to us direct for the best prices. 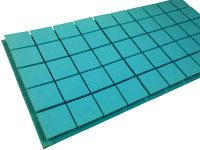 This amazing budget product is a diffusive low density foam designed to absorb sound and defuse at the same time in a 3d diffusive spread. It's perfect for Piano rooms that are to lively and have too much echo. Its self life is around 3 years but without doubt it is the cheapest foam available and that a fact. 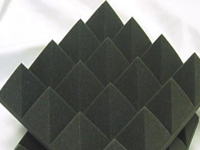 This is the profesional model of 3d foam product it is a diffusive medium density foam designed to absorb sound waves and diffuse them at the same time in a 3d diffusive spread. 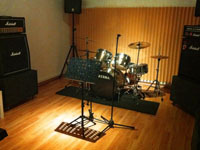 The typical useage of the aocustic foam profession model is in pofesional studios and jaming centers. Stream foam is a Difusive Acoustic foam that is designed for use with violins, Haprs, String Instruments, acoustic guitarts or other acoustic instruments with the exception of an acoustic drum kit. Cube Foam is very usefull Acoustic Foam controling material it works best at creating large amounts of diffusion due to its characteristics and high randomized design. It is able to scatter waves best out of all the foams we produce. This foam is also one of our best reseller products and many other companies are selling this in the product range across the globe. Wave foam is great at solving fluter echo problems in the corners of your rooms or in spaces where you have a little coridore or enterance. We have seen people use the tile in alternate alignment angle configuartion. This was not the intended usage of the material and can cause unbalanced frequencies when used installed incorrectly. 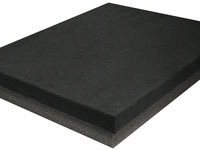 Wave foam is one of the thickest foams that we sell for acoustic use. Its designed to be used in drum rooms, bass guitar or areas that have high amounts of low frequencies. 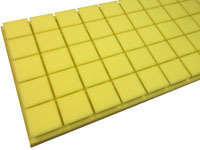 NoiseBlock Icoustic Cube Foam Pro is designed for more professional applications such as for home cinema, music rooms and professional studios. 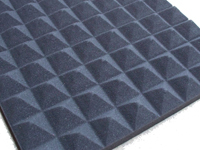 It is a medium to high density foam and fairly thick help it to also act as a base trap and control a wider range of frequencies. 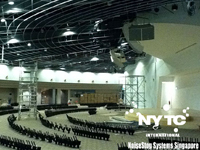 The added benefit from this product is the ability to tune the room with its special design functionality. Using Deflector and diffuser mini panels you can mount the to the foams array. 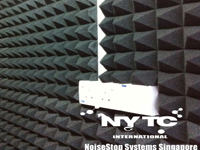 This allows for tuning of the NRC (noise reflection coeficantlcy) of the foam panel itself and in turn the Reverberation Time of the enviroment it has been installed in. The Bass Trap concept as we have mentioned before, is really just a gimmick. You don't need to have specifically a bass trap in order to remove boomy base or flutter echo from the corners of your rooms. 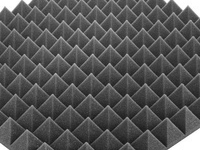 Using our super wave foam at both side of the walls that intersect the corner of the room will resolve this issue and will also resolve the flutter echo issues at the same time. 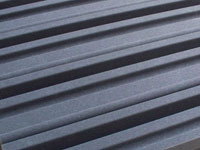 However with this in mind, we still have a high demand from some of our clients to manufacture these foams for export. 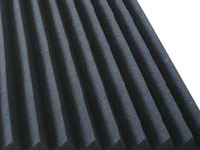 Medium density acoustic foam great to use as acoustic panels in your music rooms. These panels can also be installed into a framed system and covered in fabric. This another of our export products that is in high demand worldwide. It works by creating an isolator between your speaker and the floor. 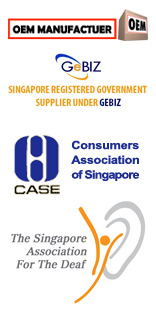 We do not sell this product on the Singapore market. 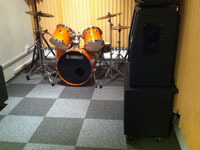 However we do give a set of them away with every home studio project build.